Peter Warr’s training and teaching now spans 34 years, covering various systems of Kung Fu and Taijiquan and in during the 1980’s, Peter formed the Wu Kung Federation U.K. In 1988 Peter went and studied at the Shanghai Physical Education Institute, where he was selected from the top eight students within the wushu examination to become a International Wushu Federation Judge. Since then Peter has judged and officiated at European and International Championships all over the world. Peter travels to China on a regular basis and now trains at the Beijing Physical Education Institute. Peter has been a Officer of the British Council for Chinese Martial Arts (governing body) since 1982 and is at present the Vice Chairman. 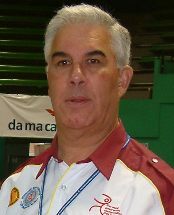 He is also secretary of the European Wushu Federation Technical Committee and has been training the European Judges from 24 countries for several years. During 1995 Peter was elected at the World Congress to the prestigious position of Vice Chairman to the International Wushu Federation Technical committee, where he has had the opportunity to work with the Chinese Wushu Research Institute, and all the Chinese Masters who are based there.